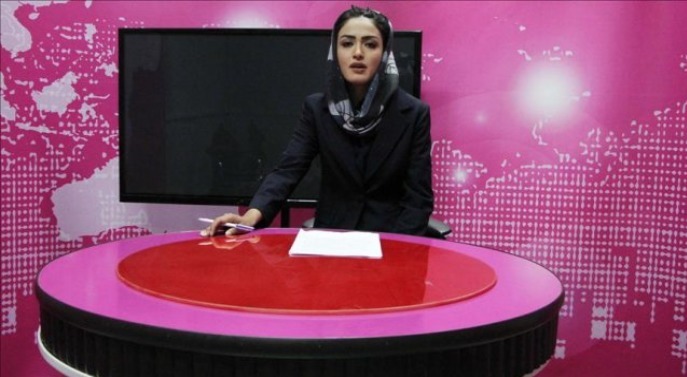 In the face of ragging violence, oppression and social barriers, a group of young Afghan women and girls have made possible the launch of the country’s one and only ‘Zan Tv’ or ‘Women TV’ for women and by women. Stationed in the heart of the capital’s ‘Shahr-e-Nau’ neighborhood, this digital-satellite channel is one of a kind in the conservative Muslim count reeling from the brutal extremist insurgency for more than a decade now. The digital TV with up to 16 hours of programing aims to highlight not only the issues faced by Afghan women, but portray their success stories and encourage them to strive for their rights. Founded by a local male entrepreneur Hamid Samar, ‘Zan TV’ has up to 54 women and girls working in different fields such as production, editorial, presentation and direction while some 16 male members of the team provide their services in the technical side. The ultimate aim is to train and equip the women and girls to be able to run it on their own. Last week, the Zan TV completed its three -month off-air test transmissions, and went on-air on Saturday June 3, 2017. Only months into the industry, the Zan TV has already achieved up to 80, 000 followers on Facebook alone. Mehria Afzali, a young and promising female journalist determined to make a mark in the industry told the fairplanet: “Afghan women are strong, we want to tell to the world that women are not only for producing children and taking care of home, but we can work alongside men for positive change in the society in all fields”. Afghanistan remains a rough and tough place for women. In its World Report 2017, the Human Rights Watch has portrayed a grim picture of women’s rights in Afghanistan. The Afghanistan Independent Human Rights Commission reported that in the first eight months of 2016, it documented 2,621 cases of domestic violence, about the same as 2015, although the number is likely much higher due to under-reporting.